So, I did what any intelligent person would do and ordered two appetizers. One was the Chicken Wings and the other was Pretzels and Beer Cheese. The pretzels not only came with beer cheese, but mustard as well. Which is dumb, of course, but the beer cheese more than made up for it. It was surprisingly spicy, but in all the right ways. 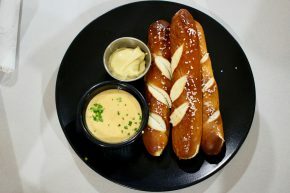 The pretzels were long and fluffy, with just right amount of chewiness on the exterior and not too much salt. 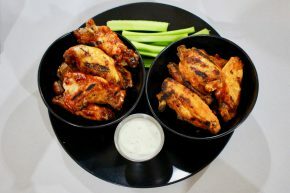 As for the wings, they were grilled, which is almost always a pleasant way to eat such things. I had half buffalo and half BBQ. They came with ranch, which is not nearly as good as blue cheese dressing, but it was better than the celery that the wings also often seem to come with for inexplicable reasons. The buffalo was pretty great, being plenty spicy like the cheese sauce although it was a bit light. The BBQ was pretty good as well, although the lightness of sauce was even more noticeable for that flavor. I liked Sip. I liked the happy hour situation. I kind of liked the concept. But I didn’t feel like it was anything overly impressive. It’s a place you go when you’re near or thinking you can use an easy and reliable meal. It’s not a place you go when you’re looking for something special, which is all just fine depending on what you’re looking for.